Normally the combination of a very early morning on a freezing cold November day would make for a rather uneventful start. This particular Wednesday morning, however, was an exception thanks to my conversation with the wonderful Jade Coles; this month’s Marguerite ‘Mover & Shaker’. Jade Coles has been the Senior Project Manager at Bompas & Parr for just over a year, where she works closely and creatively with the rest of the team to create unique, mind blowing and often crazy projects. Collaborating with commercial brands, artistic institutions, private clients and governments (to name a few), Bompas & Parr deliver emotionally compelling experiences to a wide variety of audiences. As we sat down to conduct the interview Jade pulled out her showstopper pink diamante Miu Miu reading glasses to complete her effortlessly chic attire, which included a Kenzo jumper and a large Vivienne westwood silver ring. Have you always wanted to work in the food/events/entertainment industry? Well I knew from relatively early on that I wanted to work in events. I was with Soho House & Co. for nearly six years. I started on Reception, and was then moved to Head Office where I worked as the Under 27 Membership Manager for 2 years and then the Events Programmer at Shoreditch House for 3 years. It was during my time as the Under 27 Membership Manager that I really got into events, I thought they were great fun to work on and at the time the events department at Soho House & Co. didn't have a huge team, so it worked out nicely. Originally, I wanted to be a video and performance artist because I felt it is such a good way of collaging different things together; popular culture or historical culture - you can be tactile, and I think it hit upon all those different things. I have always loved Miranda July, Shana Moulton and Joan Jonas for their collage DIY aesthetics. Having moved from East London’s Shoreditch to South London’s Peckham, what do you think of your local art scene? I think it is interesting and still quite divergent. There are lots of great artists living here, such as Joe Dennis, an amazing structural painter who also runs maverick projects, or Bosse & Baum the gallery in Copeland park. There is definately change in the landscape - it is moving away from art I feel and more towards design, which is exactly what happened in East London. This isn't that surprising as I feel with design you can capitalise on selling smaller spaces. Having said this, it certainly still has a good buzz. 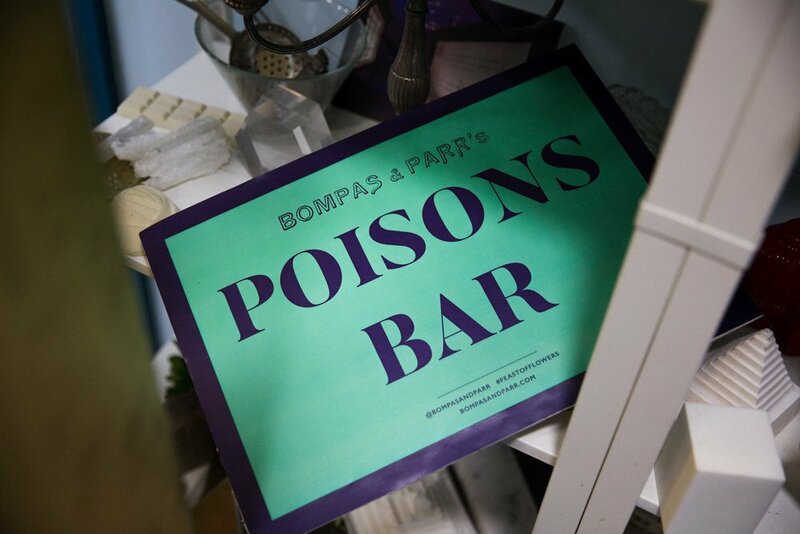 What has been your favourite project to work on at Bompas & Parr? It’s so hard to choose my favourite project for this year, some of the projects I have had the pleasure to work on personally have included the world’s first sausage seance with a bespoke sausage summoning ouija board. My fave project was probably the spa of unconscious desires for the Mondrian Hotel in London (one of my fave spots in the city). We curated a ‘spa late’ where in designers from up and down the country re-imagined typical spa objects, we got to work with Method Studio, Lucy Hardcastle and the great guys at Lyon and Lyon, the whole thing climaxed with an en masse egg healing ritual. We also had a pretty massive party this year when the Bompas & Parr studio turned 10. We had a huge party in the car park with a vegan huntress club and optic chandeliers, a volcano hot tub and many many mermen. Project managing the studios birthday was no mean feat! But so much fun. A real highlight. Next up I am working on a rather large legacy project for Bompas & Parr and a film festival with the curzon dedicated to the world of food in film, that launches in Jan 2018. How long have you been a member of Marguerite? I have been a member since July, around the same time that Bompas & Parr hosted their Marguerite event. Becoming a member was my 29th Birthday present to myself and I think it has been one of the best investments I have made this year. I got the 1938 Membership, so I am lucky and get priority. I am looking forward to the Zandra Rhodes dinner next Tuesday at her amazing space in Bermondsey. Its genuinely been really beneficial, for instance going to Blenheim Palace to see the Jenny Holzer exhibition was amazing. The Burberry dinner was also spectacular - the exhibition and the food wonderful. I like the fashion house, but hadn't found a moment to head across town to see the show, Marguerite helped make it one of my absolute priorities, not in the least due to our behind the scenes tour from the curator. So, I feel Marguerite is also doing a bit of taste making - which I think is very important to acknowledge. It's not just a ‘go to this’ service and certainly isn't always the obvious choices - it's dressed in a way that is interesting. The events are always memorable and curated beautifully. Take the master class that we did here; we started with a 40 minute whistle stop jelly making workshop (a workshop that is normally 5 hours long!) and then proceeded with a margarita making competition and talk/demonstration with founder Sam Bompas , which involved blowing things up. It was fun and everyone was having a genuinely good time. I was invited to a few events as a guest of a Marguerite member. When I went to the events, I actually did meet people who I got on with and had engaging conversations, which is what makes it so different to other networking events, where you usually don't make a connection with anyone at all. It was more natural and I felt like everyone was on the same page. Although initially I didn't join as a member I was regularly receiving the newsletters so I could see what the events were and I was really impressed by them - this is coming from someone who, at the time, was programming events - it takes a lot to impress me as I was doing up to 50 of my own a month - if you are doing that many a month it's quite hard to get excited about more events! So, that really stood out for me. You are obviously very involved in the contemporary art scene and enjoy it - do you visit shows regularly? I go to shows a lot. There is always stuff to do here in London. I love arts and culture in the broadest term, I enjoy the theatre, music, dance shows, going to different restaurants; trying new things in general. However, it always seems to come back to fine art, I don't know why that is but it tends to be my go to. I always end up in a gallery. What would your advice be to a young woman who is starting out in their career? Network as much as possible, say yes when you can, but don’t be afraid to say no when you have too much on. Stay ahead of the game through courses and training. I had a brilliant experience with the core leadership foundation for example. Reassess your goals / learnings regularly, check in with yourself. Join a charitable board. I am on the board of Deptford X and under scheme / Advisory board for HER stories. More young women should be on boards! There are not enough women on boards full stop and there are so many great opportunities. If there is a gallery or institution you enjoy going to it is worth emailing them and seeing if there is anything you can do to work with them - send your CV! Arts Charity’s are always in need to volunteering, just one or two days really in the broader scheme of things makes no difference to your social calendar! Marguerite is all about helping women in the arts and to improve/grow their strategic leadership goals. These women want to do well in their professions and to learn about different sides of their business. Being on a board is fantastic for this. You go beyond Diretor, you make assurances on massive decisions - help build the vision of a charity/organisation/institution. If you can problem solve you become invaluable - it's such a different skill set. So, join a board! What is the best exhibition you have been to in the last six months? This is really hard. I wrote down a list yesterday! I think the show that resonates with me the most, which I keep coming back to is the ‘Gillian Wearing and Claude Cahun: Behind the Mask, another mask’, which was on at The National Portrait Gallery earlier this year. I loved the visitor experience, seeing her new work and how she could collaborate with an artist that was no longer alive. There was a bit in the exhibition where she talks about her artist family and pinpointed specific artists from history and the contemporary art world who she sees as her ‘art mum’ and ‘art dad’. I thought this is actually a very important point. Just like everyone talks about spirit animals, we should have our art family - your go to people in times of strife when you need to ask the question: “what would my art mum say?” If it was Tracey Emin, she would say “F**ck it and do it! !” Channel them for advice. If I have a creative block I think ‘what would art mum do’ - I believe mine would be Sarah Lucas. I would also say Deptford X, South London’s longest running art festival dedicated to emerging artists. It will be its 25 year anniversary next year. I have gone to that festival countless times and the work just gets better and better. I thought this year was one of the festival's best yet. It focuses on London’s Deptford, New Cross and Peckham areas. Essentially we commission five pieces of work by graduate artists, they get £1000 to make something for the festival but the rest of Deptford comes alive with fringe activities - more than 200 during its 2 week period. So, you have the studios and galleries who do their bit but even cafes put on shows and the Church gets involved - the whole area of south london comes alive. You walk down the highstreet and Goldsmith Students are putting on an event - it's just really vibrant, collaborative and exciting. Do you find it easy balancing your work and social life? As I’ve got older i’ve gotten pretty good at switching off, I am sad to say many friends of mine have experienced burn out for various reasons and so, I have had to tell myself to check in and do a little more self care. It can be hard in the creative industries because the worlds of work and pleasure often overlap and that can be highly enjoyable too, You just need to check in with yourself regularly and let go of any guilt when you aren’t doing stuff all the time. Having said that, being a born n bred Londoner I think my tolerance for seeing things/doing stuff and generally experiencing life is pretty high! I’ve been massively over saturated with culture and smog since birth and so, I do like to do a lot and see a lot, that feels relaxing to me. Enjoying time in galleries, restaurants, I love a good cocktail. That's all part of the holistic story for me! What do you do to ‘relax’? If i feel stressed I find myself in a gallery space really quickly. It is great working here because you can walk to White Cube or go to the Tate Modern. I also enjoy walking in general and just making sure I go to stuff! I like doing these things on my own, it's my ‘me time’. Obviously if you love an artist and they have a show on it's exciting and you go to see them because you want to view their work. But also, if you just want to get some headspace it's great to just be surrounded by art. A gallery or museum is contemplative space. Also, I did study fine art at Camberwell, so I guess it has always been rooted in that. What is your favourite song/one of them? They are my absolute faves, they are my go to’s. If you could own one work of art what would it be and why? Such a difficult question! There are a few. One of my favourite artists is Julie Van Hoeven. I am lucky enough to have two of her Editions from when she was at the ICA a few years ago. I would of course love more of her work, as everything I see of her’s, I fall in love with; her use of colour and texture is wonderful, similar to John Booth, who I also love. But if I really had to chose, I think it would be Sarah Lucas’ ‘Pauline Bunny’ from 1997 or her ‘Self Portrait with Fried Eggs’ from 1996, which I used to love sitting under at Dean Street Townhouse. Her show at Whitechapel gallery was one of my all time favourite actually. She curated it herself in collaboration with the gallery and it showed her personal layers and story. Downstairs encapsulated 90s hedonism and as you went up to the 4th floor there was a forward thinking optimism, which emphasised gender fluidity and optimism. Will you have any New year Resolutions? Go blonde. Find a mentor, It’s been a real challenge for me to find the right person so if anyone would like to volunteer I am game!